But Bethlehem isn’t the only place that comes alive during the holiday season. Throughout the region, you’ll find traditional celebrations, unique theatrical performances, and family-friendly outings that are sure to put a smile on everyone’s face. Make the most of the holidays by checking off this list of must-sees before the New Year rolls around. Browse the wares of more than a hundred vendors at Christkindlmarkt, celebrating its 26th season this year. Start a new family tradition by seeing a performance of the annually-produced A Christmas Carol at the Civic Theatre of Allentown. Stroll through the grounds of the Lehigh Valley Zoo as you take in the thousands of lights featured in Winter Light Spectacular. Create a handmade gift for someone on your list. Color Me Mine offers beautiful ceramic trees waiting to be painted. Hunt for the perfect Christmas tree at a local farm - including cutting it down yourself! Get an up-close view of the famous star of Bethlehem as it shines atop South Mountain as part of the Bethlehem by Night bus tour. Gather round with fellow community members as local towns celebrate their holiday tree lightings. Hop in the car and enjoy a leisurely drive through Allentown’s Lights in the Parkway - you might even get a glimpse of the big guy in red! Admire the Christmas Putz, a display that tells the story of the birth of Jesus, at the Edgeboro Moravian Church. Head to the 1810 Goundie House nightly at 5:30 p.m. between Dec. 1 - 23 to experience the Live Advent Calendar. Each night, local businesses welcome guests with a special surprise. Enjoy a twist local holiday traditions as part of Touchstone Theatre’s Christmas City Follies, a one-of-a-kind variety show featuring stories from local performers. 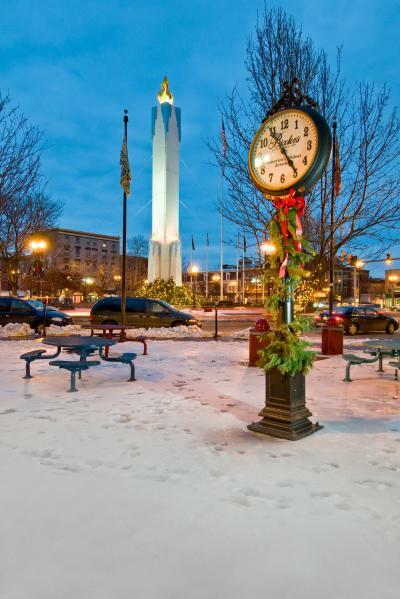 Admire the Easton Peace Candle, thought to be the largest non-wax Christmas candle in the country. Each year, the structure shines brightly in the city’s Centre Square. Treat your little ballerina to a magical performance of the Nutcracker, hosted at local venues including Miller Symphony Hall, Zoellner Arts Center, or the State Theatre Center for the Arts. Take in the charm of Bethlehem during the holiday season as you ride in a horse-drawn carriage through the city’s historic district. The Bethlehem Carriage Company offers a number of options for couples or small groups. Choo choo! Make your way to the America On Wheels Museum to catch their annual Holiday Train Display. While you’re there, grab an old-fashioned ice cream soda from the HubCap Cafe. Make your way to Koziar’s Christmas Village, a family-owned attraction celebrating its 70th season with hundreds of thousands of lights on display. Step back into the 1920s at the Historic Hotel Bethlehem as you admire their stunning holiday decorations. While you’re there, grab a festive cocktail at the Tap Room bar or enjoy their famous Sunday Brunch. Little ones will love a visit with Pip the Mouse. Each season, the Liberty Bell Museum hosts performances of The Mouse Before Christmas, a holiday favorite for youngsters. Shop for unique gifts for everyone on your list at Christmas City Village, an authentic German Weihnachtsmarkt. The wooden huts of the village line Bethlehem’s Main Street and Sun Inn Courtyard throughout the holiday season. All aboard! Join historical passenger rail services including the Colebrookdale Railroad and the Allentown and Auburn Railroad for seasonal rides with Santa or Mrs. Claus. Cozy up with a season beer. Rude Elf’s Reserve, a Belgian strong dark ale, from Fegley’s Brew Works is a favorite among locals! Visit the Moravian Book Shop, the oldest continually operating bookstore in the country, and pick up a Bethlehem or Moravian Star to adorn your tree. Take advantage of tax-free shopping on clothing throughout Pennsylvania. 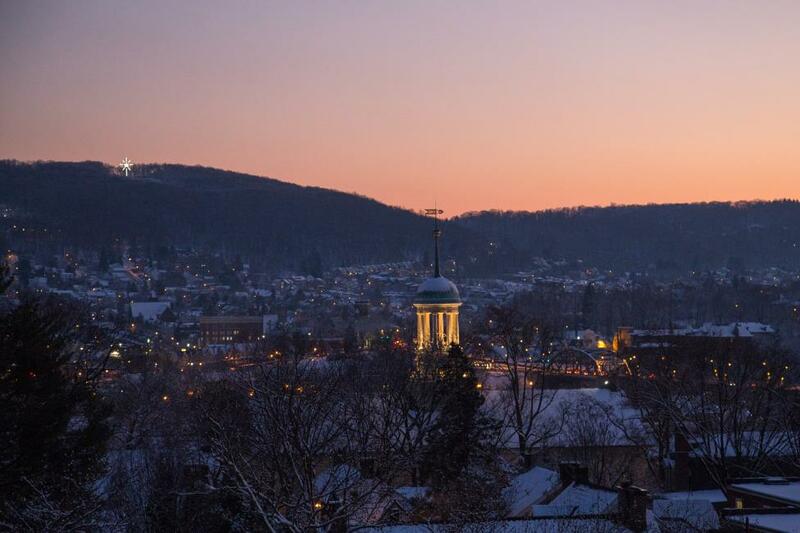 Stops at the Lehigh Valley Mall, Promenade Shops at Saucon Valley, and Crossings Premium Outlets are sure to help you check off that list. Stock up on festive treats at local candy makers Josh Early and Premise Maid. From freshly made chocolates to caramels and more, you’ll find the perfect stocking stuffers for anyone with a sweet tooth! Ring in the New Year with the whole family. Each year, PEEPSFest is celebrated on Dec. 30 - 31 on the SteelStacks campus. Be sure to catch the PEEPS drop in the early evening on Dec. 31 to commemorate the start of a new year.